Just ten minutes southwest of the Las Vegas Strip, this family-friendly resort offers all the fun and excitement of Vegas without the infamous bustle and noise. Spend the day at Adventure Dome theme park riding rollercoasters, stop by the MGM Grand for world-class shows and concerts in the evening, take a tour of Madame Tussaud’s waxworks any time of day, or enjoy the famous Bellagio Fountains after a delicious dinner with the family. As for the Desert Paradise Resort, spacious rooms featuring luxurious tubs as well as private balconies and fully-equipped kitchens, wonderful service, and amazing amenities- complimentary shuttle service to the Strip and other locations, multiple swimming pools, a splash pad and hot tub, a game room, state-of-the-art fitness center and more- are joined by a TripAdvisor Certificate of Excellence for consistently favorable reviews. Various dining and shopping destinations are just a ride away, and fishing and watersports destinations are in easy reach for those who want an outdoorsy break from the glittering city. Whether you’re looking for a family vacation of rollercoaster rides and waterslides, a couple’s retreat of night adventures and calm days by the pool, or a solo trip into the fast-paced Las Vegas casino scene, a stay at the Desert Paradise Resort- with its cozy rooms, wonderful amenities, close proximity to the Strip, and high customer satisfaction- will make your dream vacation a reality. We are the official and exclusive partner for Diamond Resorts. Only rent from official listings in order to ensure your reservation gets delivered to the resort and you receive the best possible guest experience at our properties. Just ten minutes southwest of the famous Las Vegas Strip, the Desert Paradise Resort is the perfect vantage point for local sightseeing and adventure as well as for rest and relaxation. Vegas is truly a city of non-stop fun, with offerings ranging from museum tours, amusement park rides, helicopter sight-seeing, and hot-air ballooning to theater performances, casino stops, and some of the best cuisine and shopping you’ve ever experienced. The kids will love the many parks, playgrounds, and basketball courts nearby, and adults will cheer over the proximity to Vegas’s most alluring locations and casinos- the Bellagio is only a few minutes’ drive away! Grocery stores are close by, along with Laundromat and medical services. Getting tired of the fast-paced city nights? No problem! Outdoorsy types feeling a bit out of place in the shining capital of entertainment will find their hearts soothed by a trip to the nearby Nevada countryside- peppered with lakes, trails, and mountains perfect for horseback riding, biking, hiking, jet skiing, mountain biking, golfing, and much, much more. There is no shortage of things to do and see and love in Vegas, and Desert Paradise Resort gives you all the flavor and excitement of this heart-stopping city as well as the ability to step back, slow down, and relax by the Resort pool with family and friends after a night full of adventure. Best of all, McCarran International Airport is only 7.4 miles away so travel is as easy as can be! This property charges a mandatory nightly resort fee due at check in. For details please refer 'Other things to know' in the Rates Notes section. This Two-Bedroom accommodation is an enormous 1262 sq. ft. and can accommodate up to 6 guests. The elegant Master Suite features a plush king-sized bed as well as an en suite bathroom with a luxurious garden tub and private acess to the balcony. The guest bedroom contains a cozy queen and is situated adjacent to the second full bath which features a roomy tub/shower unit. Enjoy a homemade meal courtesy of the fully-equipped kitchen- contains full fridge, oven, microwave, stove, dishwasher, coffee maker, blender and toaster as well as cookware and utensils- around the beautifully-set dining table. After dinner, feel free to relax in your spacious living area and enjoy a late-night movie on your flat-screen television (equipped with DVD player). A private balcony, in-room washer and dryer, and queen sleeper sofa complete this wonderful picture of comfort and convenience. Alongside its Vegas offerings and close proximity to the Strip, this wonderful resort offers plenty to do right on-site. 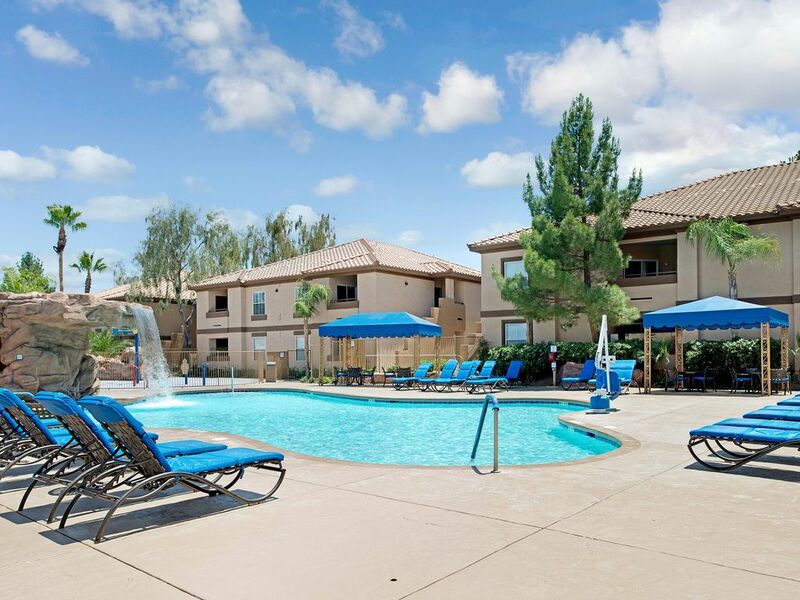 Multiple swimming pools and waterfalls, a splash pad, children’s pool, heated outdoor pool, spa and Jacuzzi as well as a fully-equipped fitness center and business center- Desert Paradise has it all. Play a game of Tennis with the family or challenge friends and family to a game of pool while the kids enjoy the Game Room. Everyone will love the activities department, which has fun-filled offering for every age, and the BBQ area- great for an afternoon lunch before heading out to the Strip for non-stop fun! Nearby facilities include a laundromat, various restaurants, and car rental service, but if you don’t want to spend all your money on car rentals and taxi fare, feel free to try out the resort’s complimentary shuttle service to the Strip and other hotspot destinations. So relax poolside, pamper yourself at the spa, tour the gorgeous resort grounds, and eat, play, and relax with family and friends- it’s your vacation, and Desert Paradise is dedicated to making sure you enjoy every minute of it. - Concierge service providing attractions and travel info as well as area discounts! We spent much time around the adult pool which was kid free, quiet, and warm. The 2 rooms we had were large and comfortable. We especially enjoyed the kitchen with almost all the supplies we needed. Also used the barbeque one night which my friend said was clean and the best bbq she had ever used. Good stay. Would highly recommend and would stay here again if we come to Vegas. I was so pleasantly surprised! Easy Uber to strip for meetings. If you can wait for 10:00 AM then they have a shuttle. Great staff. Resort fee was $20 per day not 40 like the strip. Flat screen tvs, large flat screen tvs, gated community. Safe, clean, nice... my staff will stay here again next year. Please visit us again the next time you are here in Vegas! Great stay but poor communication. Our stay was great. The condo was clean, plenty of towels, blankets,etc. Two bedroom unit was roomy and very comfortable for 6 people. We loved the pool and hot tub. Everything really was great except for communication prior to arrival. We never got any check in instructions so spent literally hours on the phone trying to reach someone with instructions,only to find that on arrival, check in was extremely simple and straightforward. It would have been helpful to know that all we needed to do was show up at the location and check in at a front desk. Those simple instructions were never communicated. I would recommend to the owner to send a reminder email with this type of information one week prior to arrival. We only stayed one night but were very impressed with the great condition of the property, the spaciousness of the unit, and the friendly service. It is well stocked and maintained and a fantastic value for the price! Next time we are in Vegas we definitely want to come back! Prior to booking I asked a ton of questions so when I arrived and things weren’t as expected I was quite disappointed and this put foul taste in my mouth about the whole experience. When provided the quote for our 4 day stay, I asked about additional charges and was told the quote covered everything by Vacay home connection. Upon arrival we were charged extras for resort fees and damage deposit. While these expenses didn’t break the bank they were surprising. I addressed them with Vacay home connect and was told nothing could be done as the VRBO post indicated there may be additional charges even though the quote didn’t. The VRBO post also indicates check out time of 11am. This is not accurate. Check out time is 10am and if you wish to stay later, you will be charged. - great location, off the strip but still very close. We had our own vehicle so didn’t take advantage of shuttle service. -dirty carpets. Our feet/socks were black within a few minutes of walking around unit. Gross! -can hear everything in unit above you. We were in the main floor unit and could hear footsteps walking above us. Even over the noisy a/c. Our trip was to experience Vegas so we didn’t check out what else the resort had to offer and the weather was too chilly for a pool visit. Thank you for taking the time to share your feedback. We are happy to hear that you did enjoy the unit and the amenities. Tamara we are sorry to hear about your concerns and we do our best to be clearly transparent in regards to our property amenities and resort fees. This information is stated within the listing, as well as our check-in and check-out times for Desert Paradise Resort. Note that within the booking quote it is only the nightly rate, service fees and taxes, nightly resort fee can not be added to the booking reservation. Please refer to this listings Other Things to Know section. - ­­­24 Hour Front Desk - Check in Time: 4:00 pm - Check Out Time: 10:00 am - All Guest Suites are Non-Smoking - Minimum age requirement for check-in is 21 years of age. - All reservations that have an alternate guest checking in should make prior arrangements with the resort. - Pets are not permitted and strictly enforced with the exception of Service Animals. AT CHECK-IN A photo identification, credit card for $100 security deposit and a nightly rate of $17.00 plus tax resort fee will be required (cash is not an acceptable form of deposit). Resort Fee includes access to Wi-Fi and resort amenities (pool and hot tub, shuttle, gaming room, BBQ area, business center services, fitness center and local/toll free phone calls). This property charges a mandatory resort fee due at check-in. Nice place. Needed a bit more cleaning before our stay. Good job on towels, paper towels, toilet paper, etc. we would book it again. Thank you for your comments. We work hard to make our guests happy and appreciate you taking the time to share your thoughts about your recent stay. We take our guest feedback as a way to improve our service and as such we have shared your comments with our on-site team. OTHER THINGS TO KNOW - ­­­24 Hour Front Desk - Check in Time: 4:00 pm - Check Out Time: 10:00 am - All Guest Suites are Non-Smoking - Minimum age requirement for check-in is 21 years of age. - All reservations that have an alternate guest checking in should make prior arrangements with the resort. - Pets are not permitted and strictly enforced with the exception of Service Animals. AT CHECK-IN A photo identification, credit card for $100 security deposit and a nightly rate of $23.95 plus tax Resort Fee will be required at check-in. (cash is not an acceptable form of deposit). Resort Fee includes access to Wi-Fi and resort amenities (pool and hot tub, shuttle, gaming room, BBQ area, business center services, fitness center and local/toll free phone calls). This property charges a mandatory resort fee due at check-in. Please check listings for details. Rates subject to change. Click "Book it Now" for rates and availability. Reservations may be cancelled up to 8 days prior to arrival. A cancellation fee of 25% of the reservation will be charged. Cancellation requests made 7 days or less prior to arrival are non-refundable.